Thanksgiving is about families coming together, so it’s always appropriate when Bob’s Burgers treats us to a holiday episode featuring all five Belchers in the same story. This year’s entry takes aim at one of America’s most daffily nonsensical traditions, the annual presidential pardon of a turkey. As both Bob and the episode’s closing scene repeatedly point out, there’s no coherent way to get so invested in the wellbeing of one specific turkey and then chow down on one of its cooked compatriots on the big day. That works in the episode’s favor, though, because the Belcher kids—Linda absolutely counts as a Belcher kid in episodes like this—are at their most resolved when their goals are totally absurd. Throw in a deputy mayor who isn’t nearly as corrupt and powerful as he believes he is, an intrepid reporter who doesn’t have any clue what’s going on, and a mayoral aide who is well aware she isn’t handling any of this nearly as well as her sister would have, and “I Bob Your Pardon” has the ideal setup to put Bob through another round of holiday hell, albeit one that feels less fresh and distinctive than the show’s best holiday episodes. When all the Belchers set off on a caper like this, there tend to be three roles in the group for the various family members to play. The simplest role is that filled by those just those along for the ride, with no particular investment in what’s going on beyond being loud and spouting one-liners while still somehow taking everything far, far too seriously. Then there are those who have specific, if not always terribly logical reasons for wanting the adventure to continue. And then there’s the Bob role of realizing how ridiculous all this is, complaining about it a lot, and still going along with everything out of some combination of love and exasperation. Bob doesn’t have to fill the Bob role—Linda has, on occasion, and even one or two of the kids have done spot duty as the voice of reason—but Bob’s Burgers plays to its well-defined strengths when H. Jon Benjamin gets to mutter incredulously about all unfolding around his character. All Bob wants to do is find some cranberries and get back to talking to his own, oven-ready Thanksgiving turkey… you know, like a normal person. The other roles also go to the most logical picks: Linda and Gene are generally best-served in that “small doses” kind of supporting role, while Louise and Tina are better able to handle what passes for the episode’s emotional arc. On that point, it remains impressive just how much Bob’s Burgers has built up Louise from her early days. At this point, Louise’s softer side has become a storytelling shorthand, one that doesn’t need a lot of episode-specific development for the audience to understand what’s going on. She puts up a tough exterior around Drew the turkey and then immediately bonds with it over what she perceives as its backtalk. We’ve reached a point in the show’s evolution that Louise can do all this without any of the other Belchers needing to call her on seemingly acting out of character. But Bob’s Burgers also shows us her as unrestrained agent of chaos often enough that her soft side still has impact. That’s not really any longer the case with Tina showing off her passionate, brashly confident side—it took a while for me to remember that she’s shown just as much growth as Louise has, if only because she has basically finished her maturation from the awkward, shy weirdo we met way back in season one. If there’s one issue with “I Bob Your Pardon,” it’s that everything is a touch too familiar. 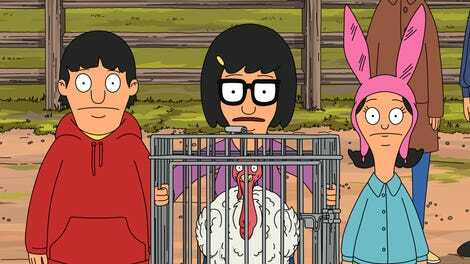 The show plays to its strengths by giving the Belchers their various roles in the story, but there’s not much new to learn from seeing Linda gleefully enable the kids’ ridiculous behavior while Bob grouses. That isn’t a problem in and of itself, as I wouldn’t argue the objective of Bob’s Burgers is to teach us new things about the characters. It’s just that without much by way of character-based surprises, the episode must live or die on its jokes. The gags are all at least solid: I especially enjoyed Bob’s mounting frustration with people stepping out in front of his car, Ralph the reporter politely declining Gene’s offer to stab him, the visual of Ralph later fumbling around to close the car’s trunk, and Bob’s final rhapsodic splash in the cranberry pool. There’s a bunch here that works. But there’s also a lot here that feels remixed from earlier episodes: I can’t think holiday car chases without going back to “Christmas In The Car”, though Marsha is far less terrifying than Gary the candy cane driver. Marsha’s harried phone conversations and slow realization she should quit reminded me of Janet the Bat Mitzvah coordinator from “Mazel Tina.” Rob Huebel an Paul F. Tompkins are both guest voice stalwarts, and it’s an odd coincidence that Huebel’s reporter Ralph feels like the print version of Tompkins’ main character on the show, Randy the documentarian—who made his debut trying to teach Bob a similarly misguided lesson about animal liberation. It’s not that everything in tonight’s episode is a rip-off of something else the show has already done. Much of these, in fact, are only superficial links. The point is more that “I Bob Your Pardon” couldn’t keep me engaged enough to not make such links. That likely reads harsher than I mean it. Nine seasons in, I can still count on just one hand—maybe just one finger—Bob’s Burgers episodes that aren’t a fun, funny half-hour. And looking at how The Simpsons got ever more outlandish as it reached a similar point in its now 30-year lifespan, I won’t complain that Bob’s Burgers trusts itself enough to stick to its core strengths. “I Bob Your Pardon” recalls some late-period entries from the show’s spiritual forerunner, King Of The Hill: enjoyable and reliable, but seemingly not interested in taking the kind of risks the show’s best episodes would. 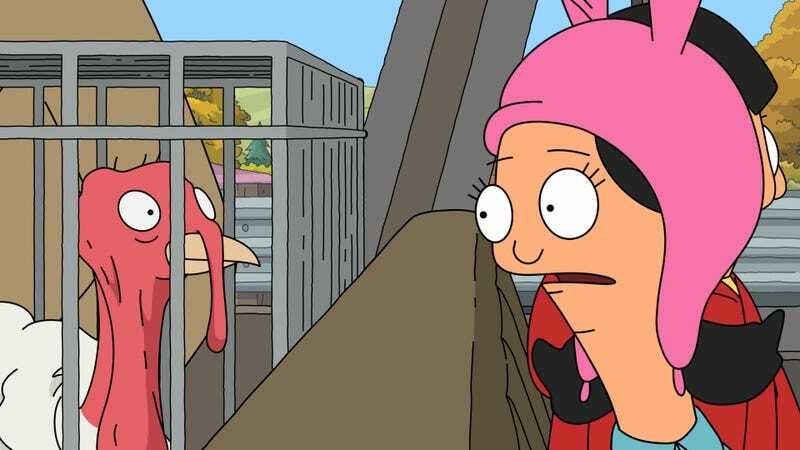 Given all the car chases and ridiculous confrontations tonight, that feels like it shouldn’t be true, but just look at the show’s past Thanksgiving episodes: Mr. Fischoeder asking the Belchers to pretend to be his family to impress a saucy sharpshooter, Bob’s beloved turkeys mysteriously ending up in the toilet again and again, irate wild birds taking control of the Turkey Trot at Wonder Wharf, Bob braving a snowstorm to bring Gayle to Thanksgiving dinner, the Belchers discovering Teddy is an out-of-control hoarder. This show never, ever messes around when it comes to Turkey Day episodes. “I Bob Your Pardon” certainly doesn’t let down that legacy, but it doesn’t quite find its own unique strand of Thanksgiving absurdity. Maybe I just needed more of Bob talking to his turkey. One random highlight was Bob asking the confused gas station clerk whether there were any cranberries there. That guy was trying to be far more helpful than the situation or his own competency could ever allow. The bit with Louise scaring off the coyotes felt oddly handled. First, I thought the coyotes had immediately descended upon Drew P. Neck—I was glad to see him unscathed, but that still threw me off. While I suppose there wasn’t much more to do with them once Louise took care of business, the introduction of wild predators still felt like the episode had gotten more real and serious than it had been previously, as though that ought to have been the climax instead of a mid-episode plot beat. For the record, “Pro Tiki/Con Tiki” is still the only episode I can remember being actively not good. Though having said that, I now feel like I owe it a rewatch. Bringing things full circle, I have to reiterate how bizarre the turkey pardon is. The president still has turkey on Thanksgiving! Bob’s right, it’s hypocrites everywhere!